On May 28, 2015 I celebrated my 60th Birthday. It passed without much fan fair, a simple dinner with a friend at the Tommy Bahama restaurant along with two tickets to the Smith Center to see James Tormé in the Cabaret Theater on Saturday the 30th. Perhaps one of the most interesting and coolest gifts that I have ever received in my 60 years of having birthdays came from my sister, Pam, in Austin, Texas. Several years ago, Pam and I had discovered that we had both been researching the family history. I had been documenting my findings in a Word document, but she was more advanced plotting her findings on Ancestry.com. The family was at its height in the 12th century, when Tigernán Ua Ruairc was king of Bréifne. In 1256, a great battle was fought between the O’Rourkes and the O’Reillys near Ballinamore. This led to the division of Breifne between the O’Rourkes and O’Reillys. The Bréifne region was split into East Bréifne and West Bréifne. 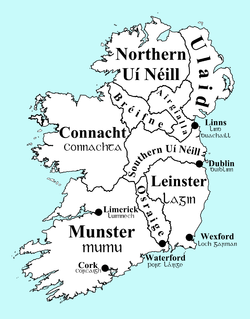 The Ó Ruairc kings (O’Rourke) maintained lordship over West Bréifne (mainly Co. Leitrim). The Kingdom of Bréifne region was part of the kingdom of Connacht up until the time of Queen Elizabeth I. In that time, it was shired into the modern counties Cavan which became part of Ulster and Leitrim remaining a part of the province of Connacht The ÓRuaircs were effectively lords of Breifne O’Rourke through the turbulent 16th century. Now back to my 60th birthday present from my sister. So after returning from a breakfast meeting with my editor, I find a box at my door. It is rather light and sort of flat with the Amazon.com logo. Inside were birthday cards from my mother and sister. Pam had also written a letter; that was sealed in her card. Happy Birthday? You’re probably wondering why such an unusual gift and how in the world I even thought of it; well, I’m going to tell you. A little more than a year ago I checked out a website that intrigued me. I could own land in Scotland for a small amount of money and legally be called a lady. Ha! I thought that’s the only way Mom would ever get one out of me, so I investigated it further. Suffice to say I bought an “estate” and can now be legally known as Lady Pamela. However, I didn’t tell Mom because I knew she’s laugh at me – now that I have told her, I can say I was right. What really drew me to buying the land is the conservation aspect – the fact that hundreds of people own the land so that it’s impractical for a company to come in and try to develop it. That, and to say I own land in Scotland. Come on, let’s be real, that’s just way too cool! So I bought a plot of land for you too. With your LEED certification and your writing skills, I thought that this might make an interesting subject to write about. Perhaps a story by Lord Craig Ruark could be perceived as gimmicky but it would certainly catch the eye. I told Mom that I thought you would enjoy this gift, even if it wasn’t something you’d buy, because of your interest in genealogy. Actually, you have two plots as they were running a special with I bought yours, probably to complete the last of the Glencoe plots. You have a 3’x3’ plot in a new section called Lochaber and a 1’x1’ plot in Glencoe. I have a 3’x3’ in Glencoe – which when you really think about it is only about enough space for two people to stand side by side! The website is http://highlandtitles.com. I know this is probably the most unusual gift you’ve ever received, but at least it’s yours in perpetuity or until you sell or bequeath it away! I really hope you like it. 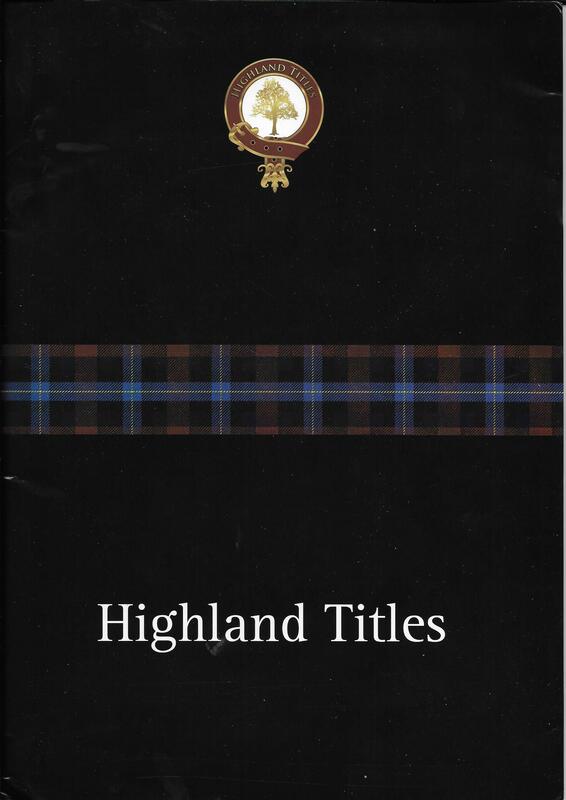 In the box was a black folder with a Tartan plaid stripe from Highland Titles. 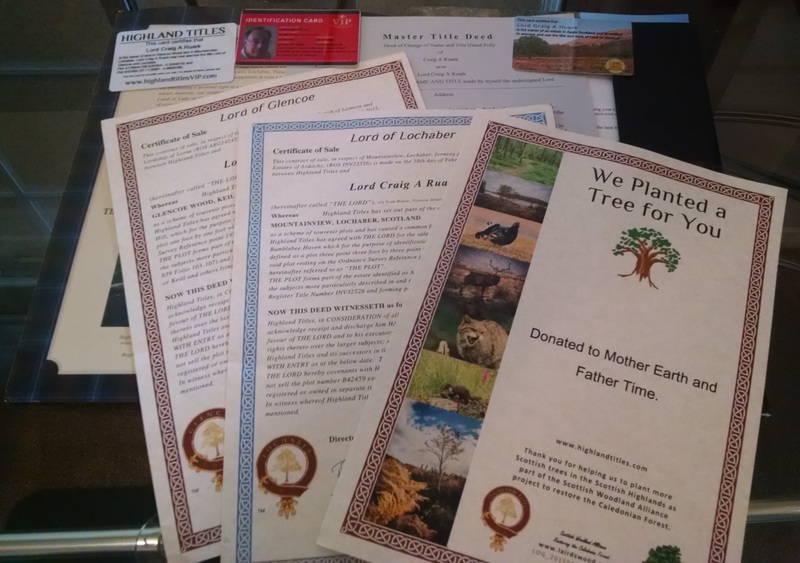 Inside the folder, a separate deed to each property, identification cards, and a document showing that a tree had also been planted in my name…a donation to Mother Earth and Father Time. 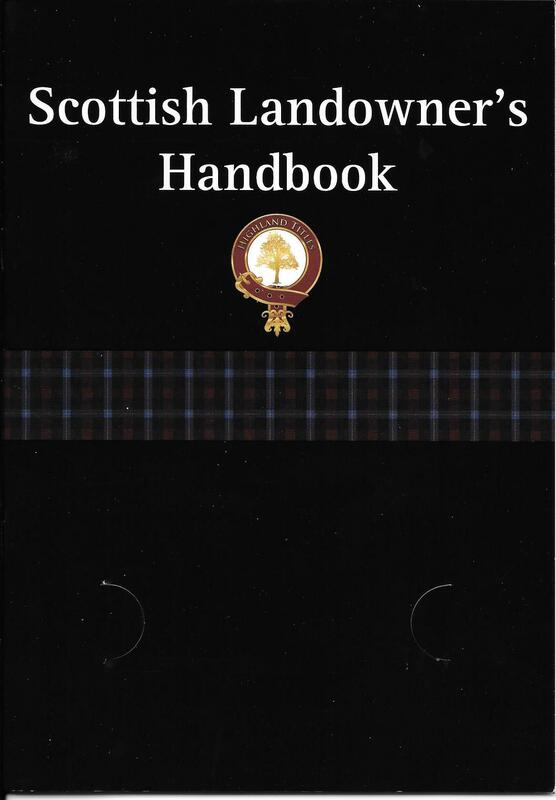 Along with the deeds and other paperwork, is a Scottish Landowner’s Handbook, that among other things, talks about the titles of Laird, Lord & Lady. Laird is not a noble title, but a ‘corporeal hereditament’ (and inheritable property that has explicit tie to the physical land) and cannot be bought and sold without selling the land. It does not entitle the owner to sit in the House of Lords and is in this sense the Scottish equivalent to an English lord of the manor. 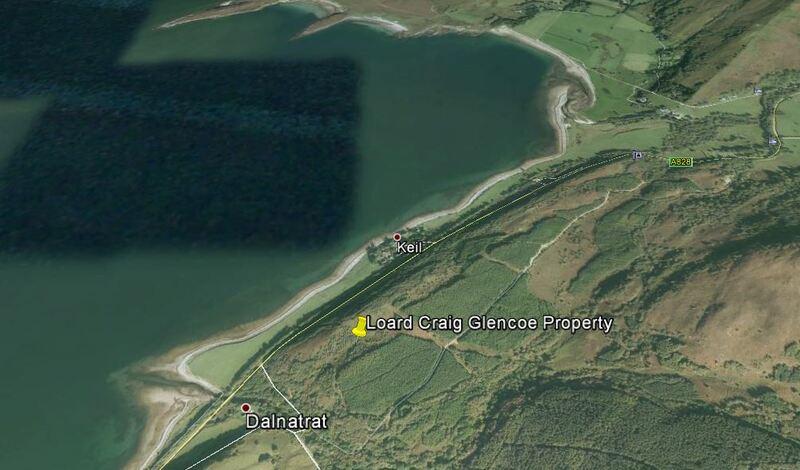 The Glencoe property is located on a bluff overlooking Loch Linnhe. The road below is tree lined which makes for a beautiful drive but does not allow for a view of either the bluff above or Loch Linnhe below. 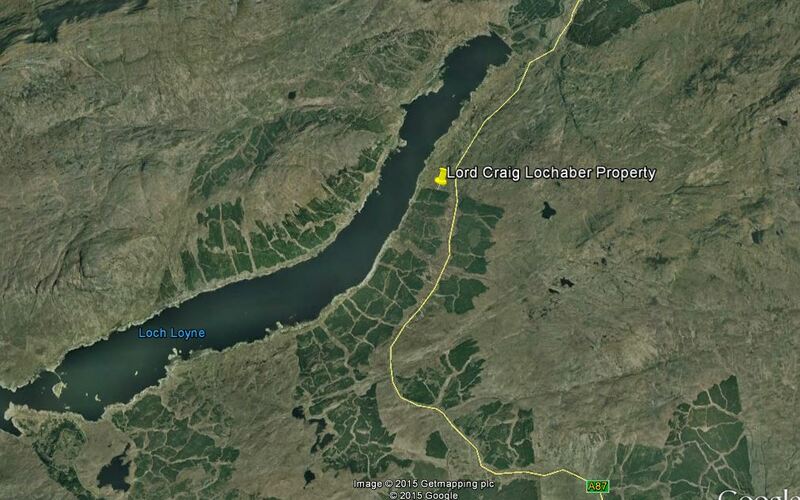 The Lochaber property is much more open and is located on the east bank of Loch Loyne. 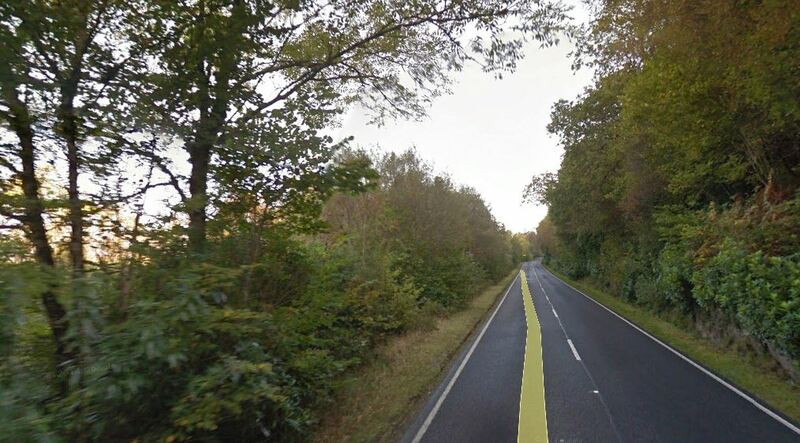 My property is just inside the first row of trees. According to the letter from Highland Titles, thousands of landowners visit their properties each year. In fact, I read about an annual convention of landowners. To make each landowner’s stay more enjoyable, Highland Titles has partnered with a variety of local service providers “who will be glad to offer you preferment when you visit.” VIP privileges can be found at http://experience.ht. One of the places on the list is this wonderful old world hotel called The Ballachulish (I would give you a phonetic pronunciation but I haven’t a clue). So what can I do with this extraordinary gift? According to my landowner’s handbook, I am entitled to visit anytime I please. I can take a walk in Glencoe Wood, take photographs of my “estate” and picnic by the river. I will be able to enjoy bird watching, fungi spotting, and country pursuits in a tranquil setting. I am also welcome to plant a tree or scatter ashes. I can also display the Arms of Glencoe and wear the Glencoe Tartan (perhaps I will learn firsthand, what they wear beneath those Scottish Kilts). Regardless of what I do, I am now…with gratitude to my sister…a conservator of a small piece of nature. 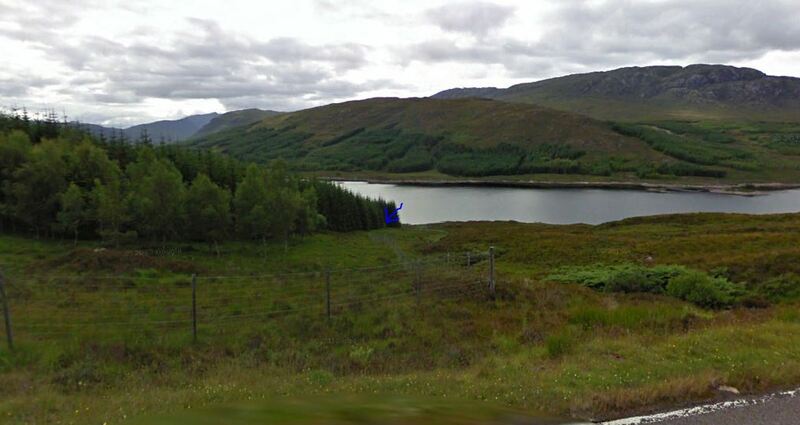 This entry was posted in Uncategorized and tagged Conservation, Glencoe, Highland Titles, Ireland, Lochaber, Lord Craig, Mountainview, O'Rourke, Ruark, Scottland, Sustainability. Bookmark the permalink.